Fresco in the Sacro Speco (‘sacred cave’) of St. Benedict in Subiaco, possibly the oldest and most faithful image of Francis. Can Money and Spirituality Mix? This entry was posted in money, Spirituality and tagged Assagioli, money, money and spirituality, psychology, psychosynthesis, Saint Francis on October 4, 2017 by Catherine Ann Lombard. 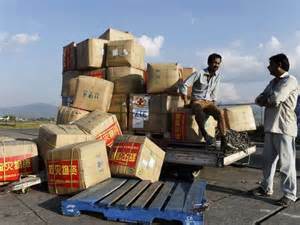 Nepal aid piles up while our prayers arrive instantly. Perhaps you find yourself overwhelmed at times with all the requests for financial help that seem to bombard you. Walking downtown in a major city, you might be asked for money from a stranger or find a beggar sitting along the road with a sign for help. At that moment, we are often besieged with existential questions. What should I do? How can I really help? How much money is enough? Will the money help at all? Soon after the news of the earthquake in Nepal, my husband and I did send money (along with our prayers) to an organization that was helping with relief efforts. As you may know, humanitarian aid is still having trouble reaching those in need, as NGOs face massive logistical difficulties, including Nepalese custom regulations. It does seem that our prayers have become more valuable than our money, able to arrive instantly beyond the roadblocks and border controls. Currently, I am a support member of an international Christian fellowship, and we are working through financial requests from various charities. There seems to be no end to the need for money! Money to rebuild homes in flooded Malawi, to pay for a young man’s education in India, a school for orphans in Indonesia, Ebola health workers in Senegal. And, of course, now for those suffering in Nepal. The list seems infinite. How can we possibly choose what cause to support? This entry was posted in Balancing Opposites, Feelings, Other, Relationship, Spirituality and tagged Good Samaritan, money, prayer, psychology, psychosynthesis, relationship, spiritual, spirituality on May 12, 2015 by Catherine Ann Lombard.